Looking for a new batch cocktail? This not-too-sweet Strawberry-Kiwi Daiquiri is the perfect thirst quencher for long, lazy nights on the patio. When Anna and I were in Miami for a conference a few years ago we went a day early to explore the area. During happy hour one night, the bartender was handing out samples of one of their bar menu drinks, a version of a Strawberry-Kiwi Daiquiri. I would have never ordered this had I just seen it on the menu, but because of the sample, I gave it a whirl. Here is the definition of daiquiri according to Wikipedia: A daiquiri is a family of cocktails whose main ingredients are rum, citrus (typically lime juice), and sugar or other sweeteners. However, that is NOT what I think of when I think of a daiquiri. I think of uber-sweet and slushy drinks with an umbrella in them. I love the umbrella, but the sweet slushy drinks are not my thing. How is this Strawberry-Kiwi Daiquiri different? This is not your syrupy sweet, slushy daiquiri. This is a daiquiri the way they are meant to be. And once you take a sip of it, it will be the only way you drink a daiquiri, too. It took me exactly 2 days before I replicated it upon our return. I’m not a fan of really sweet drinks, but sometimes I want a change of pace from my favorite gin and tonic (short with two limes, please). As a rule, I’m not really a rum drinker unless it’s in a mojito, but I think this Strawberry-Kiwi Daiquiri is going to change that! 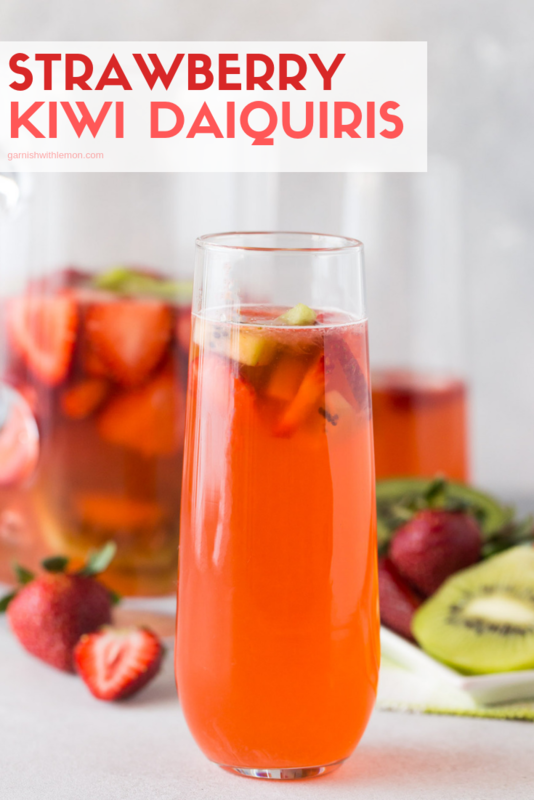 What do you need to make this Strawberry-Kiwi Daiquiri? Easy peasy. This cocktail keeps things simple and only uses a handful of ingredients. You need fresh lime juice, simple syrup, and strawberry-kiwi infused rum. How do I make infused rum? Infusing the rum is easy; the hardest part is waiting for it to be done. 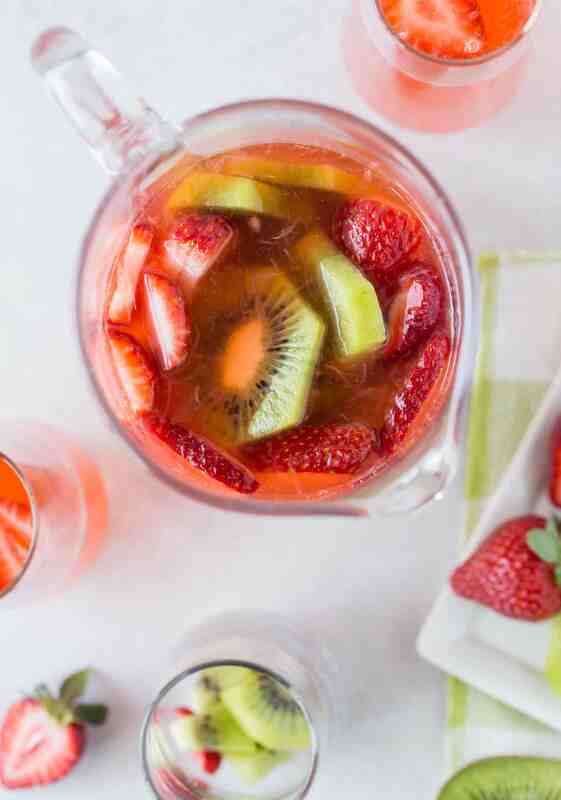 Simply cut your strawberries and kiwi in slices, place in the bottom of a large pitcher and pour rum over the top. I like to use a pitcher that seals so I can set it on its side. After all, refrigerator space is at a premium in my house. Holla! My drink of summer (if it ever shows up) has been perfected. If you’re looking for me, I’ll be on the deck, cocktail in hand, enjoying the fabulous weather. Batch Cocktails are the way to go to make entertaining easy. 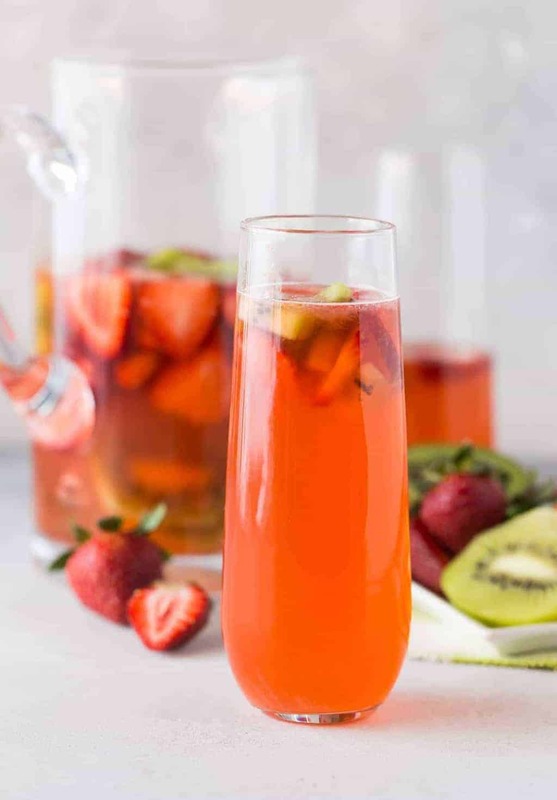 Check out some of our favorite summer sippers. Place chopped fruit in a glass container, add rum and cover. Refrigerate for 36-48 hours. Strain fruit and store infused rum in refrigerator until ready to use. Place all ingredients in a shaker filled with ice. Shake to combine and strain into glass. Serve immediately. Garnish with kiwi slice if desired. I think there is a typo kind of error in the first step of the recipe. Add fruit vs add rum? Good catch! You’re right; it was a typo. All fixed now! Love this recipe! I’ve never had daiquiri, but always been curious about it. Now that I have a recipe, I will be making it soon. I don’t like too sweet drinks in hot weather too. Thanks! Incredible Lisa! Such a beautiful cocktail! Pinned! ah, Portland is going to have temps in the 80’s for the next several days – I was already planning some deck time, now I need one of these! Oooh, so jealous of your weather! Enjoy! It definitely is a keeper! Cheers!